Britain is at risk of being buried under a rash of fly-tipping, one of the UK’s leading waste management companies says. According to BusinessWaste.co.uk , every single day there are scores of incidents where hazardous waste is dumped in streets, fields and residential waste bins across the UK as unscrupulous business criminals attempt to avoid fees and the landfill tax. The situation is made worse by local government budget cuts, meaning that councils are increasingly stretched in the battle against fly-tippers, who seem to be getting the upper hand. 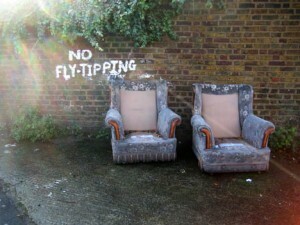 A scan through local newspaper reports show that fly-tipping is a constant and severe problem for local authorities the length of Britain, despite the threat of £50,000 fines for those caught. Even Hart Council in North Hampshire – voted the area with the best quality of life in Britain for two years in a row – reports that it has received 150 reports of fly-tipping between March and May of this year, with officials considering installing hidden cameras at hotspots to catch culprits. “Unfortunately, while massive fines are a deterrent, the real problem is catching these people in the act, and with councils struggling for funding it has given the criminals the edge,” said Mark.